CM has staff on site 24/7/365. Working in shifts, our expert analysts make sure the lights in this vital monitoring centre are always on. 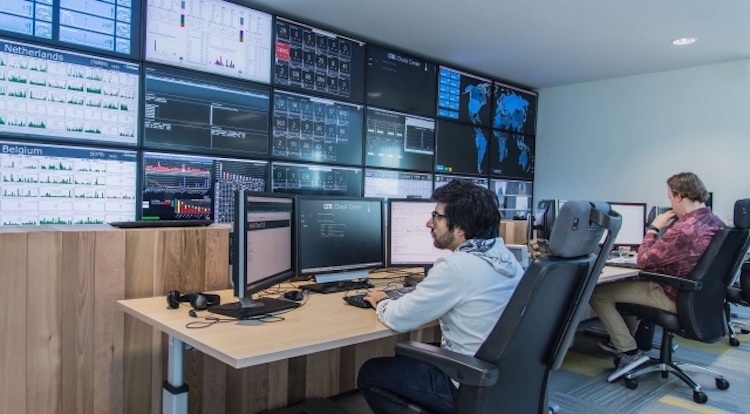 From this Network Operations Centre (NOC), they are continuously monitoring security, performance and connections to suppliers and customers. This team of experts is equipped to handle any incident effectively, efficiently and immediately. Therefore, you can always count on our 99,9% uptime and worldwide delivery in under 10 seconds. Our pro-active monitoring guarantees the fastest delivery of time critical messages in high volumes via our SMS Gateway API. Moreover, all CM services are hosted on our privately owned and operate environments. Therefore, we are not dependent on other parties to take proper measures. Also, CM has full control over all data, including transport, encryption and accessibility. Finally, no public cloud services are involved in the creation and delivery of our services. Therefore, you can rest assured that all data is handled with the upmost care, in full compliance with GDPR and ISO 27001. If any questions would arise on your end, for example if you have any trouble sending out a campaign, you can also call upon our support team to help you to the best solution in an instant. Our Genius representatives and Online Success team are here to help you make the most of each mobile campaign. Finally, it is important to note that CM has over 100 developers working at the constant improvement of our platform. This means our platform is built with the best building blocks, containing all the latest mobile messaging innovations. Therefore, you can always count on us to provide you with the latest in mobile technology, including rich features and high-end security. Want to give our SMS Gateway API a try? Just register on our platform and receive free test messages for you to give our platform a try with.